Derry senior hurling manager Tom McLean has challenged his players to turn around a disappointing season by getting their Christy Ring Cup campaign back on track with a Round 2B victory over Down at Owenbeg on Saturday. 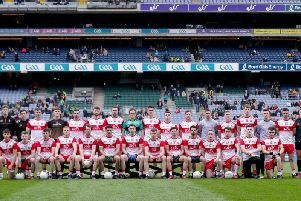 The Oak leafers finished bottom of Division 2A after a run of five straight league defeats, a sequence compounded by last week’s 2-20 to 0-15 loss to Roscommon in the opening round of the competition which took them to Croke Park last season. The only people that can put things right are the players and we have to be in the right frame of mind for the game. We are determined to look forward and are totally focused on down on Saturday. It leaves Derry still seeking their first competitive win of the season but, far from being downbeat, McLean believes Saturday is the perfect opportunity for the players to set the record straight. “This is our home match and the boys are anxious to get the win,” said the Derry manager. “You can make all the predictions you want but any time Derry meet Down it comes down to whoever wants it most on the day. “The players were feeling down after the Roscommon result but that is understandable. Losing games is never nice and, like winning, it can become a bit of a habit but there’s no point feeling sorry for ourselves or thinking about what might have been. What has happened this year is in the past. McLean will be planning without Paddy Kelly, Jonathan O’Dwyer, Eugene McGuckin and Darragh McCloskey but believes his squad can cope with the absentees. “We never got going last weekend but I was always expecting a tough game down in Roscommon. They had some real momentum after winning the Nicky Rackard last year and winning their promotion game. It was a huge home game for them and they played well. “We are missing a few players but you have to concentrate on the boys that are available, not the ones you’re missing. “The injuries give another player a chance to come in and show they deserve to be playing. This is a big game and we have to pick ourselves up because we are now at the stage when the chances are running out this season. The winners from Round 2B proceed to meet the losing counties from Round 2A while the two defeated teams from Round 2B play-off with the loser meeting the Nicky Rackard Cup winner to determine who plays in the Christy Ring Cup next season.